Platte Plains Trail is a 15-mile network of trails with four trailheads and a walk-in campground. The shortest route to White Pine Campground is a 1.2-mile walk that begins at the end of Peterson Road. But the most scenic route and the one described here begins at Platte River Campground and is commonly referred to as the Lasso Loop. This hike is a 7.2-mile walk, with White Pine Campground reached in 2.8 miles. 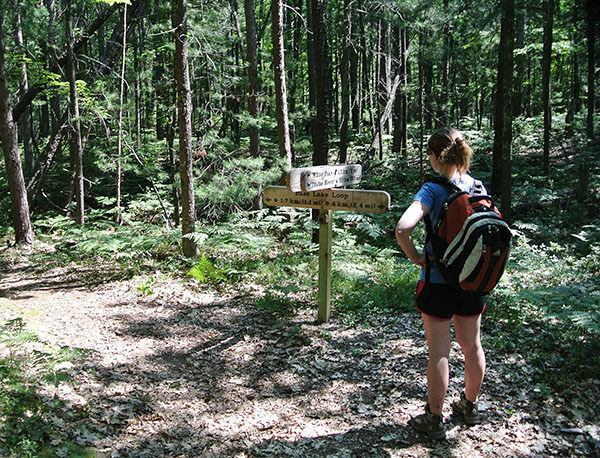 With its easy hiking and ban on mountain bike use, Platte Plains is one of the best destination in the Lower Peninsula for anybody’s first overnight adventure in which all that’s needed is strapped to their back. Surprisingly, for a park as overrun as Sleeping Bear Dunes can be in the summer, the demand for campsites at White Pine is moderately light. Often when there is a line of campers waiting for an opening at popular Platte River Campground, walk-in sites at White Pine are still available. If planning to spend a night in the backcountry, pack in water along with your food, tent, sleeping bag, and other equipment. There’s a community fire ring in the campground, but cooking is best done on a backpacker’s stove. Don’t forget the bathing suit; the swimming is excellent in Platte Bay. You also need to obtain a backcountry camping permit either at the park headquarters or the ranger contact station at the Platte River Campground to stay at White Pine. 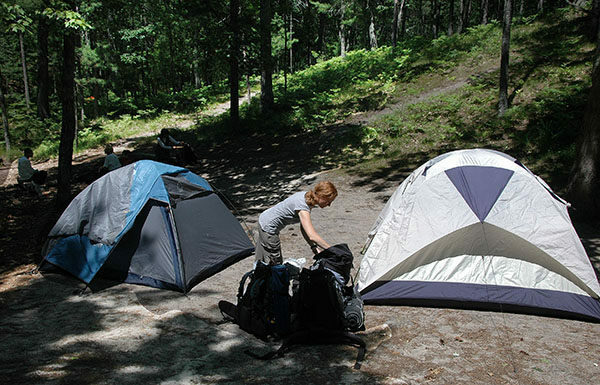 The permits are handed out on a first-come-first-serve basis and allow up to two tents and four persons per site. There is a nightly fee to stay at the six walk-in sites that is above and beyond the vehicle fee required to enter the national lakeshore. The hiking season runs through the typical spring-to-fall period, with the heaviest demand for the walk-in sites in July and August, especially on the weekends. These summer months are popular for those who like to romp across hot dunes to cool off in the surf of Lake Michigan. October brings in the spectacular fall colors, while by late December or early January a good base of snow has formed and cross-country skiers begin arriving. Parking is available near the ranger contact station or the Walk-in Camp Area loop where a trail, marked by blue triangles, departs into the pine forest and is easy to follow in the hilly terrain. 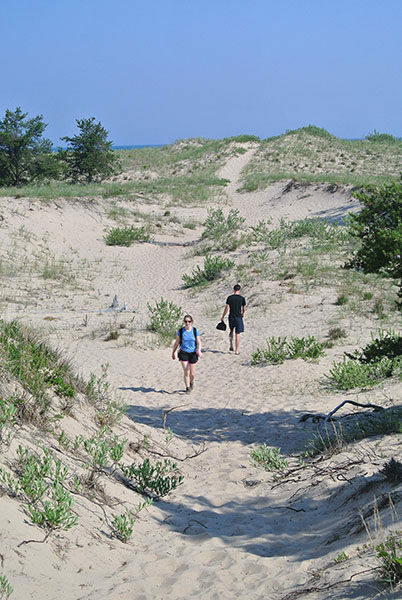 In less than a half mile, you break out of the trees and enter the low dunes along the Lake Michigan shoreline where many will quickly discover how tiring hiking on soft sand can be. You arrive shortly at a locator map, where straight ahead are the cool breezes off the Great Lake and a scenic view of the beach. To the east (right) is the sandy path to post No. 9 and the junction with the Railroad Grade Trail. You hike over open dunes and through patches of beach grass. Here and there an odd pine or cottonwood is thriving, but for the most part you are in the heat of the sun until the trail swings sharply south at Mile 0.8. The views are excellent here and a short spur heads north to the beach. In less than a quarter mile to south is post No. 9 where the trail merges with the old railroad grade. You don’t have to be a train buff to envision a line running along the wide and level path. The narrow-gauge line was built in the 19th century between Edgewater, a logging town on the west end of Platte Lake, to docks on Lake Michigan, where ships were loaded with lumber destined for Chicago. The old grade heads south towards M-22, Lasso Loop continues east (left) at post No. 9. Marked by green (easy) triangles, the trail enters a forest for more solid footing than the dunes and at Mile 1.6 breaks out in a grassy clearing to arrive at Peterson Road. A short walk down the road to the left is a parking area, vault toilet, another stretch of beautiful beach, and sweeping views of the bay. Northeast of Peterson Road, the trail remains in the lightly forested area before entering a thicker stand of oak and pine. At Mile 2.6 is post No. 7, the junction with another access spur to Lake Michigan. 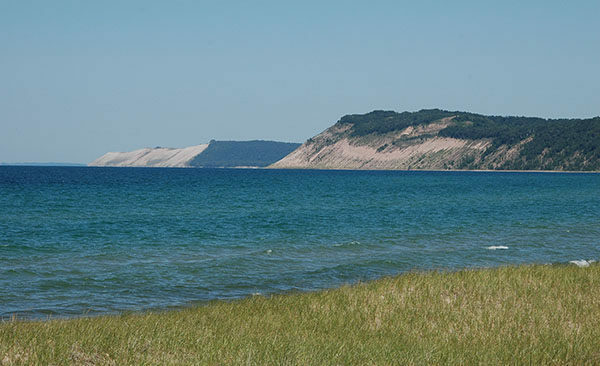 The views along the spur are stunning as you can see the entire bay along with the famous Sleeping Bear Dunes to the north and South Manitou Island out in Lake Michigan. The main trail swings east from post No. 7 and at Mile 2.8 reaches post No. 6, marking White Pine Backcountry Campground. White Pine is located in a narrow ravine, with wooded ridges running along both sides of the secluded sites. The campground offers a vault toilet and a community fire ring but no source of drinking water. There is no view of the lake from the campground, but near site No. 6 a path wanders west to quickly reach an area of windblown dunes. From the high perch of the first one, you are rewarded with an immense view of the mainland dunes and South Manitou Island. The Lake Michigan beach, with its clear waters and sandy bottom, is just another dune or two away. Return in the evening to watch the sun melt into Lake Michigan. What more could you ask for in a campsite? From the campground, the loop continues due east. The triangles change color, from green (easy) to black (advanced). It’s rated primarily for skiers, but hikers will also notice that the walking is a little more strenuous. The approaching ridges and hills are ancient shoreline sand dunes that mark the position of Lake Michigan after each glacial ice melt. The steepest climb is within a quarter mile of post No. 6, and after topping off, the trail follows the crest of the ridge around a marshy pond. You descend, climb again to skirt another pond, and then drop quickly to the base of that dune. The trail levels out somewhat to wind through an impressive stand of pines, and at Mile 3.6 comes to a post No. 5 and the junction with Bass Lake Loop. To the north (left) is the 1.1-mile spur to post No. 4, marking Trail’s End Road trailhead. Lasso Loop continues south (right) along a level stretch for another interesting change of scenery. On one side of the path are towering pines with a thick understory of ferns while on the other side is a series of marshes filled with cattails. The largest marsh is seen at Mile 4 and often in June wild irises can be spotted from the trail. Other marshes follow for almost the entire 1.1-mile length of this stretch. Post No. 14 is reached at Mile 4.6 and here Lasso Loop heads right. Within a third of a mile you breakout at Lasso Road at post No. 13 and follow the two-track briefly before veering off to the west at post No. 12, a spot that is occasionally missed by hikers who continue to follow the dirt road. The forested terrain remains level for the next mile, then the trail resumes skirting ancient lakeshore dunes. At one point, there are forested ridges towering over you on both sides of the path. After swinging so close to M-22 that on a busy summer weekend you can hear the traffic, the trail climbs a ridge to wind past more marshy areas. The open wetlands and meadows remain visible until you drop back down into the forest and at Mile 6 cross Peterson Road a second time. On the other side of the road, the trail swings north and eventually merges with the Railroad Grade Trail. Turn right here and follow the old line. Spurs to the campground quickly appear with one to Loop 2 posted. You emerge in that loop next to campsite No. 217 and can then follow the campground road to wherever you parked your vehicle. Located in a ravine between two forested dunes, White Pine Campground is an escape from the noise and bustle of the park’s busy tourist season in midsummer; yet the campground still lies near the three main attractions of Sleeping Bear Dunes. 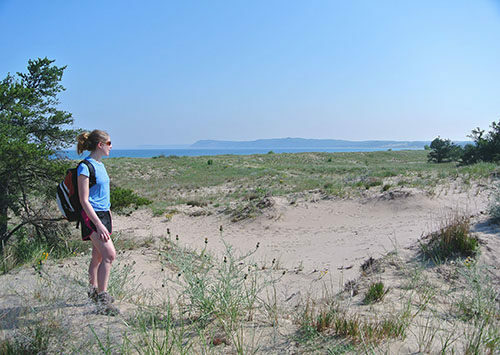 Within a short walk of your tent are windblown dunes, panoramas of the rugged shoreline and the Manitou Islands, and isolated stretches of Lake Michigan beach. Platte River Campground features 179 sites, including those with hook-ups for recreational vehicles and 25 walk-in sites that are secluded in the woods at the west end. There are also a picnic area, water, showers, rest rooms, and a ranger contact station with information. You can reserve a site through the Recreation.gov (1-877-444-6777; www.recreation.gov). From the headquarters, head south on M-22 and in 9.5 miles you reach Platte River Campground. There are actually several places in the campground to enter the trail system. At the back of loops 1–4 are short spurs that connect to the Railroad Grade Trail. 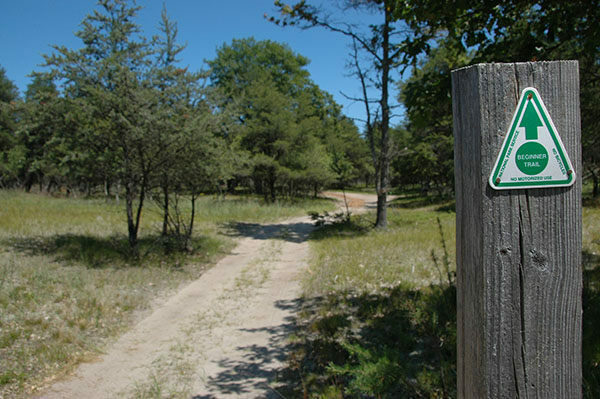 This hike begins from the walk-in camp area, where a trail leads directly to Lake Michigan and is marked by blue (intermediate) triangles. Alternative trailheads to the Platte Plains include the west end of Peterson Road, Otter Creek, reached 4 miles south of Empire and west on Esch Road, and Otter Lake Trailhead, 6 miles south of Empire at the west end of Trail’s End Road.